The assembly of components shows the complex cooperation of all business fields of the esw GROUP. 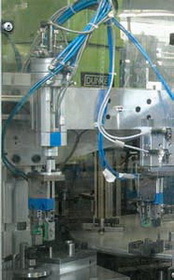 This overlapping area comprises the manual as well as the automatic assembly of components. We especially mount plastic coated stamped parts and cold formed parts to produce many different kinds of components. A special example of a connection of cold forming and stamping technology is the ESW ceiling anchor, a self-developed and protected component for the building industry used as a fixing element for dropped ceilings.